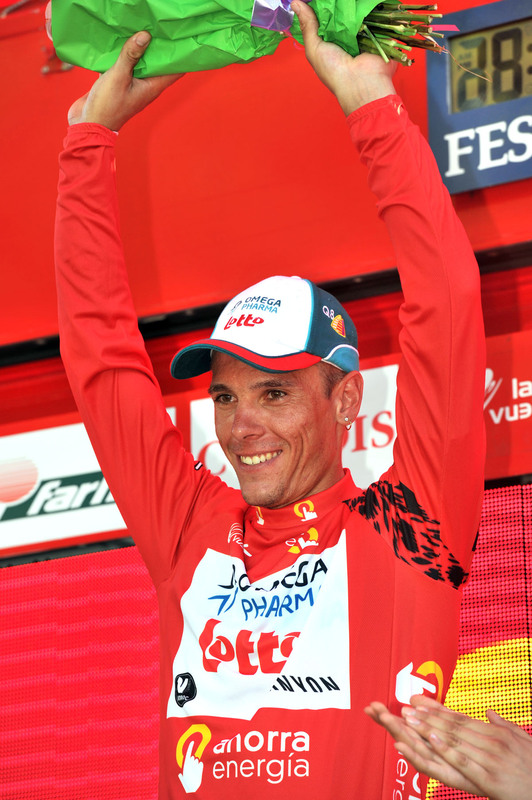 Philippe Gilbert (Omega Pharma-Lotto) won stage three of the Vuelta a Espana in Malaga after attacking the bunch on an uphill punch in the final kilometre. Overall contender Joaquin Rodriguez (Katusha) chased hard after Amstel Gold Race winner Gilbert, but couldn’t catch the Belgian. However, he did distance the other favourites, earning valuable seconds in the fight for the red leader’s jersey. Igor Anton (Euskaltel) came across the line in third, with Ireland’s Nicolas Roche (Ag2r) in sixth. Pre-stage leader Mark Cavendish (HTC-Columbia) struggled with the heat and terrain, finishing 25 minutes behind Gilbert and losing the overall lead to the Belgian. Rodriguez moved up to second overall, with Cavendish’s team-mate Konstantsin Sivtsov third. Earlier, Spaniard Serafin Martinez (Xacobeo Galicia) had looked like he had the stage win sewn-up after soloing way from a breakaway but was painfully caught as he passed under the final kilometre banner. Martinez was part of a seven-rider group that got away on the first of stage three’s two categorised climbs, the category two Puerto de Ojen. Martinez, Mikael Cherel (Francaise des Jeux), Javier Ramirez (Andalucia-Cajasur), Biel Kadri (Ag2r), Egoi Martinez (Euskaltel-Euskadi), Jelle Vanendert (Omega Pharma-Lotto) and Niki Terpstra (Milram) worked well together, at one point extending their lead over the bunch to around nine minutes. As the group neared the second big climb of the day, the first category Puerto del Leon, the escape group started to splinter and Martinez seized the chance for a solo attack. He quickly distanced himself from his former companions. Behind, Katusha forced the pace up, a change in acceleration that was too much for Andy Schleck (Saxo Bank), who dropped off the back. The bunch quickly whittled away Martinez’s gap and caught him with exactly one kilometre to the line. One-day specialist Gilbert then accelerated away from the bunch on the uphill drag to the line, where the stage win and red jersey waited for him. Team Sky suffered a bad day, with several riders succumbing to the affects of an overnight stomach illness. Both John-Lee Augustyn and Ben Swift – who placed seventh on stage two – abandoned the race. Simon Gerrans was also affected, but managed to complete the stage. 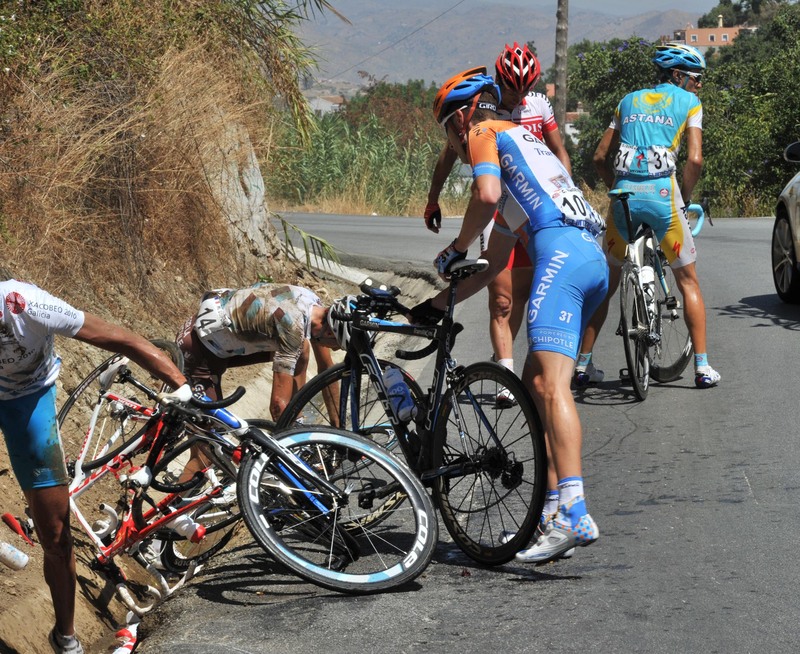 Tuesday’s 2010 Vuelta a Espana stage four starts in Malaga and finishes in Valdepenas de Jaen 183.8km later. Along the way, the riders will navigate three categorised climbs.